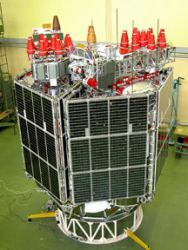 [Updated June 1, 2011] Two Galileo in-orbit validation (IOV) satellites will comprise the first launch on a modified Soyuz rocket from the European Union’s spaceport in French Guiana. Now scheduled for October 20, the launch will mark the beginning of the creation of the operational constellation for Europe’s GNSS system. The most recent Galileo launch window had been in August. An earlier commercial mission had been expected for the new version of Soyuz this summer, but Arianspace — in consultation with European officials — decided to wait for the inaugural launch to carry the Galileo satellites. On May 6, ESA signed a contract with the French space agency, CNES, to ensure that Europe’s Spaceport is ready to operate three launchers — Ariane, Soyuz and Vega. An official ceremony marking ESA’s handover of the Soyuz launch site to Arianespace took place the following day, after the site was declared ready for the first flight following the completion of a simulated launch campaign last week. 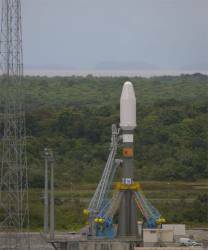 Final testing of the Soyuz launch site at Europe’s Spaceport in French Guiana began on April 29. The dry-run was designed to ensure that the Soyuz and the new facilities work together, while allowing launch teams to train under realistic conditions. The Soyuz vehicle was transferred from the preparation building to the launch zone and erected into the vertical position. The mobile gantry was then rolled out to the pad and the vehicle’s upper composite, comprising the Fregat upper stage and payload fairing, was hoisted on top of the launcher. Participating in this exercise were Arianespace; Russian partners for Soyuz, including the Russian Space Agency (Roscosmos), the Samara Space Center-TsSKB-Progress, NPO Lavochkin, and TsENKI; along with the French space agency (CNES) and the European Space Agency for operations and management of the spaceport.